Hello! It's time for another Mojo Monday sketch (#287)! It's the first sketch of the month which means it's Mojo Contest Week... play along for a chance to win some Verve stamps! Today's fabulous sketch is brought to us by Julee! 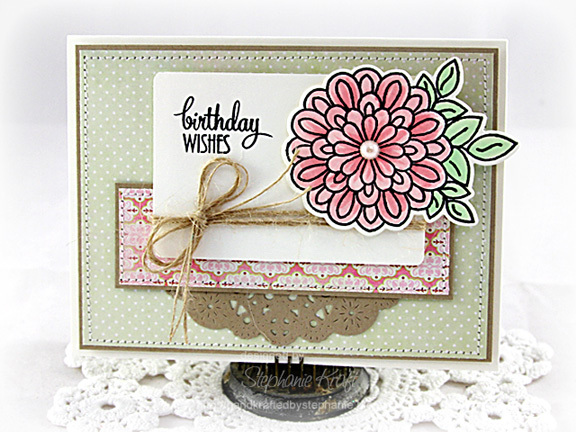 Accessories: A Cut Above Dies: Goodness Flowers Die Set (Verve), Doily Die (Cheery Lynn), Corner Chomper (WRMK), Markers (Copic), Pearl (Kaisercraft), Twine (May Arts), Foam tape, Thread, Sewing machine. Delightful! I love the soft spring colors. Very pretty card Stephanie! Love the soft color palette and the beautiful blossom! Great flipped version of the sketch! Love the soft colors you chose! So pretty, and gorgeous details! Such a soft and beautiful card, Steph. Love that Kraft doily and the bit of twine.